If you’ve ever made it to the very front of a crowd during a concert, you have met Mike. Mike loves music, people, and energy. He probably waited for hours to see his favorite artists, and he became best friends with everyone around him. 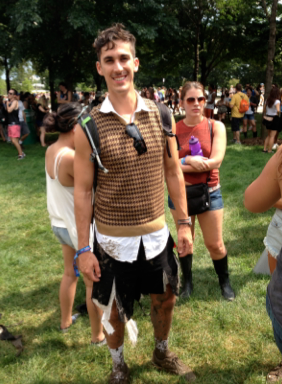 The mud covering his shoes and ripped up shorts tell us that Mike got was pretty rowdy for bands like Alt–J and The Killers. But Mike isn’t completely careless. He loves these bands and he wants to look nice for them. The ‘70s sweater vest with a short sleeve button up match Mike’s high–tight and messy haircut just right. His black new–age sunglasses tell us he is in it for the long haul, so don’t plan on getting ahead of him during Mumford and Sons. The Sunday Afternoon look is an essential image for a music festival located in the middle of Chicago’s hustle and bustle. It’s the perfect look to please your family at Sunday brunch and your boss at work on Friday before you race off to catch a headliner. Joe pulled together the perfect Sunday afternoon outfit. His light cotton button up transitions perfectly to a festival look with his effortless half untuck. 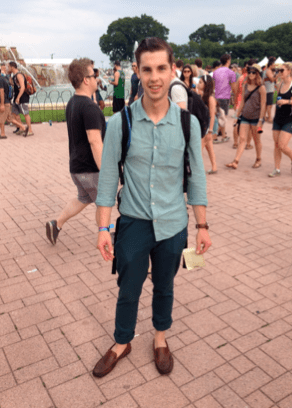 Joe wore lightweight navy blue dress pants which rolled up perfect to enhance his festival transformation. And finally, Joe’s burnt sienna dress shoes are just as worthy of compliments at Sunday church as they are at a Vampire Weekend show. 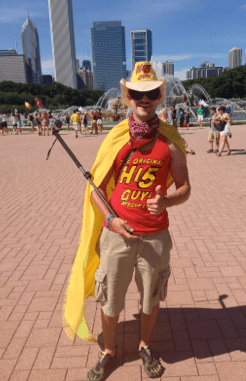 If you were at Lolla, you saw a million American flags. From tank tops to shoes, patriotism was at its finest this year. 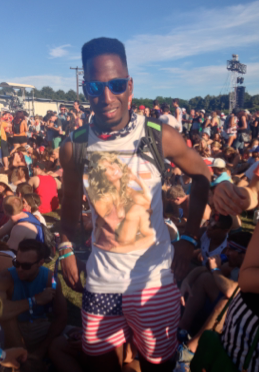 I absolutely had to find the most patriotic of Lollapalooza, and Brad won me over immediately. From his Chubbies American flag shorts to his stars and stripes bandana, Brad made me feel proud to be a modern American. Brad’s classic ‘80s tee and the hair to fit the look combined a vintage and modern image of a new American pride that doesn’t focus solely on winning wars. I found Brad (very fittingly) rocking this look at Kendrick Lamar. wouldn’t have been complete without this fun outfit. I’m not going to talk about his toe shoes or cargo shorts.. But hey! The colors of his outfit at least coordinate for whatever “energy” he was on.